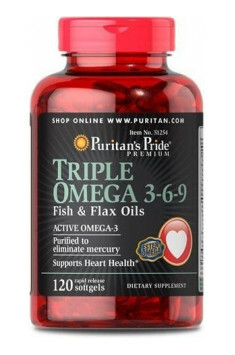 Puritan's Pride Triple Omega 3-6-9 is a dietary supplement containing a set of unsaturated fatty acids omega 3-6-9 in precisely selected doses, providing the best benefits for your organism. The preparation positively influences the whole organism and demonstrates multi-level effect – it helps to maintain homeostasis, protects from brain-vessel disorders, lowers the risk of cancer development and also takes care of maintaining proper skin functions. Summing up, Puritan's Pride Triple Omega 3-6-9 is a dietary supplement essential not only to maintaining physical efficiency, but also mental abilities. Multidirectional activity of the preparation makes it effective both to prevent civilization diseases as well to support their treatment. Triple Omega 3-6-9 120 caps. The product contains a complex of unsaturated omega 3, 6 and 9 fatty acids in a carefully selected dose. It is ideal enrichment of diets poor in these substances. This supplement shows a preventive action for atherosclerosis, ischaemic heart disease and helps to improve the appearance and condition of the skin, hair and nails. It should be taken during increased energy requirements, recovery and intensive workouts. Puritan's Pride is a global supplement brand with over 30 years of experience in the industry not only of diet supplements but also of personal care products. They use only the highest quality raw materials that pass strict examinations and laboratory tests.